The temperature and humidity sensor sends only humidity. Please help me understand. Hello! 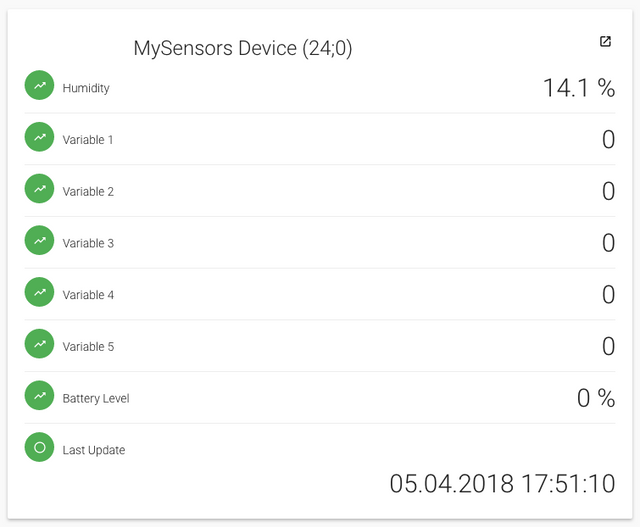 I'm trying to connect a temperature and humidity sensor to Openhab 2.2. The sensor is detected automatically as "Humidity Sensor". Please help me understand and solve the problem. What am I doing wrong? @mfalkvidd Thank you! Everything worked! @vladimir great! Thanks for reporting back. @mfalkvidd Tell me please, can I somehow unite them in one device? Now this sensor is displayed as two separate devices. But this is one physical device. @vladimir I have no experience with OpenHab. Sorry. @mfalkvidd I assumed that this change is made in the code of the sensor itself. For example, during its presentation. @vladimir in my experience, it is not. Domoticz unites some of my sensors even when I don't want them united. My guess is that OpenHab is equally annoying, but in the other direction. I agree with @mfalkvidd. This is not due to the sensor code but this is the way OH handles the data. I'm using OH but the MQTT 1.x binding that does not support discovery. I manually define three logical devices, temp, hum and batt in the .items file. I think this is the expected behaviour of OH. If you want them presented as one device you could combine the measurements into one string by using a rule and do some string manipulation. I do this to combine wind speed and direction into one string.